Visual Art | Real Time: An international online artistsâ€™ collective brings its diverse work to Provo. The current international juried show Visual Identities/Real Space is co-sponsored by ArtBistro.com—a social networking site of sorts specifically for visual artists. The selected artists are all members of the site, and the show at Sego physically brings the works face to face—plucked from a cyber sea, and shipped from cities around the United States and abroad to Happy Valley. Although it’s a crowded show by Metcalf’s standards, for an exhibition encompassing so many themes and pieces, the curatorial aspect is extremely thoughtful. It is well balanced, nicely hung, and, in accordance with the center’s goal of helping folks navigate and view contemporary art, it brings provocative work in, presenting it in a manner absolutely on par with major institutions. Proper viewing of art is not innate. Case in point: Mark Rumsey’s installation “Chenrezig Lotus” is composed of hundreds of screen-printed, petal-shaped pieces of fabric arranged in a floral design—on the floor. It is a nice piece and not an uncommon display method, yet it was walked on a number of times during the opening. “It’s a signifier of people’s ability to view contemporary art,” Metcalf says. His tone is not smug; he sincerely hopes to be a catalyst in this learning curve of viewing art. The show is full of strong work that will engage people. Particularly loaded and effective is the work of Pooneh Maghazehe, an Iranian-Shiite artist living in New York. She combines embroidery, text, Amish garb and, as she puts it, “gansta bling,” to make a new kind of dream coat. With “Holy Shiite!” embroidered in Old English across the front, “Women’s Amish Dress” is a cultural conglomerate of a garment. Rhinestones, religious symbols and intense thread work make a loud “narcissistic pledge of allegiance to various cultures,” as her artist statement puts it. She is as articulate and edgy as her work. Maghazehe’s other piece, “Out of Bounds,” combines a very specific propagandist Islam pattern (symbol of fundamentalist culture) and tampons saturated with bright paint (blatant female symbol) to analyze the concept and difficultly of identifying in several disparate cultures. These two in particular seem to intersect with the notion of femininity and the veil. But the tampons, harking back to feminist art of the 1970s, hang in front, their colors splashing onto the white, mathematically perfect pattern hiding behind them. There are also pieces far more abstract. Looking at Yusuke Nishimura’s “Jackson Heights,” you see calm, although not necessarily noteworthy, printed color gradation. However, an amazing and time-consuming process yielded it. First, Nishimura photographs daylight, starting in the morning and continuing throughout an entire day as it passes through the window, taking a color shot every time it changes very slightly. Then they are scanned into a computer, where they are layered. A gradation is applied, so that each original monochromatic observation is represented vertically and chronologically. It’s like converting a Beatles record to MP3—maybe a step further with the neurotic digitizing and systemizing of an elegant natural phenomenon. The end piece is exquisite; you might not catch on to the process at first glance. Bringing together far-spread constituents, breaking (and utilizing) digital barriers and, above all, curating an exhibition that has such a large range is not easy. It can be even more of a challenge to hang it and have it not be like a trip to the Chuck-A-Rama salad bar. 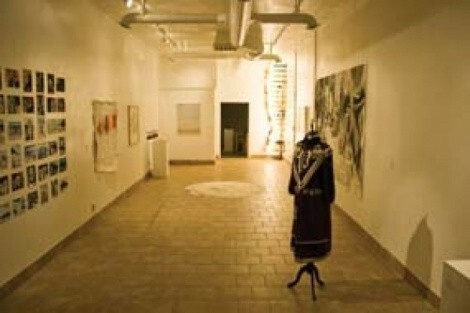 Sego Art Center is truly progressive and a swell host to the next generation of art. Visual Identities aptly reflects that.